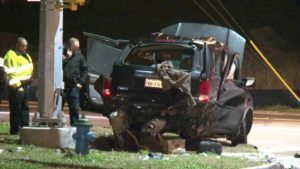 Katy (January 25, 2019) – On Friday night around 9:30 p.m. Jose Chavez was traveling with his wife Bernice Chavez and three children. Mr. Chavez was traveling eastbound on Morton Road Ranch when he turned left onto Elrod Road, pulling in front of Rafael Quiroz, who crashed into the right side of the family’s car. Nora Chavez, 3, was ejected from the car and taken by LifeFlight to Memorial Hermann Hospital in the Texas Medica Center in critical condition. Elija Chavez, 6, was taken to Texas Children’s Hospital Katy in critical condition and later died. The parents and the third child, Ella Chavez, 4, sustained minor injuries and were transported to Memorial Hermann. Mr. Quiroz was not injured. Authorities believe Mr. Quiroz was speeding in the area. Authorities also believe that Mr. Chavez did not properly restrain his children in the car and may face charges for that.